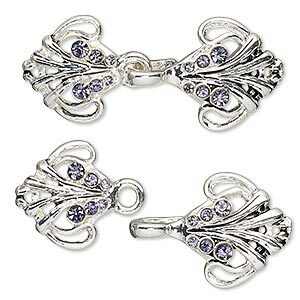 Clasp, hook-and-eye, glass rhinestone and antique silver-finished "pewter" (zinc-based alloy) and pewter (tin-based alloy), purple, 40x17mm fancy teardrop. Sold individually. Item Number: H20-A4386FN Have a question about this item? 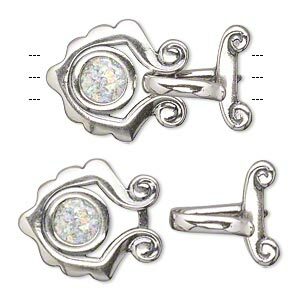 Elaborately detailed "pewter" (zinc-based alloy) and pewter (tin-based alloy) hook-and-eye clasp features an attractive antique silver finish and glass rhinestone accents. 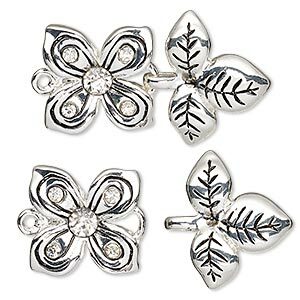 Clasp, hook-and-eye, glass rhinestone with antique silver-finished "pewter" (zinc-based alloy) and pewter (tin-based alloy), clear, 39x24mm flower and leaves. Sold individually. 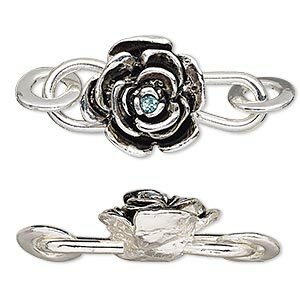 Clasp, hook-and-eye, glass rhinestone and antique silver-finished "pewter" (zinc-based alloy), aqua blue, 33x18mm flower with 2 jumprings and hidden hook. Sold individually. 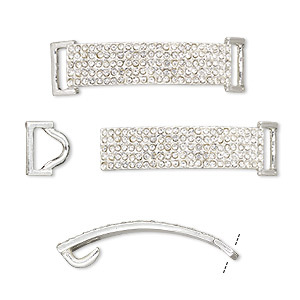 Clasp, hook-and-eye, glass rhinestone and silver-finished "pewter" (zinc-based alloy), clear, 46x6mm single-sided curved rectangle, 3.5x2.5mm inside diameter. Sold per 2-piece set. 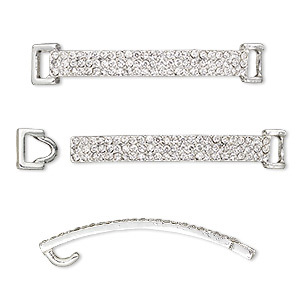 Clasp, hook-and-eye, glass rhinestone and silver-finished "pewter" (zinc-based alloy), clear, 48x8mm single-sided curved rectangle, 5x2.5mm inside diameter. Sold per 2-piece set. 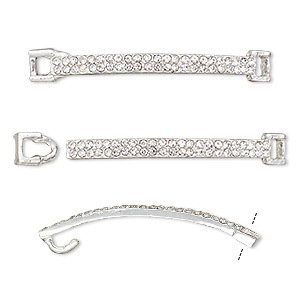 Clasp, hook-and-eye, glass rhinestone and silver-finished "pewter" (zinc-based alloy), clear, 49x13mm single-sided curved rectangle, 10x3.5mm inside diameter. Sold per 2-piece set. 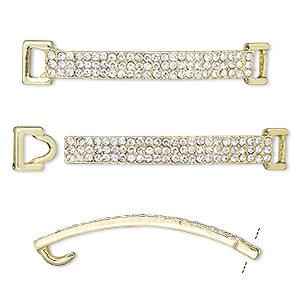 Clasp, hook-and-eye, glass rhinestone and gold-finished "pewter" (zinc-based alloy), clear, 46x6mm single-sided curved rectangle, 3.5x2.5mm inside diameter. Sold per 2-piece set. 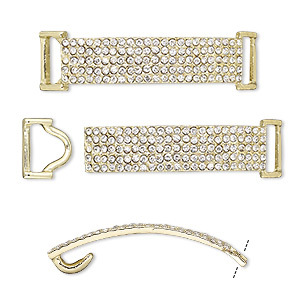 Clasp, hook-and-eye, glass rhinestone and gold-finished "pewter" (zinc-based alloy), clear, 48x8mm single-sided curved rectangle, 5x2.5mm inside diameter. Sold per 2-piece set. 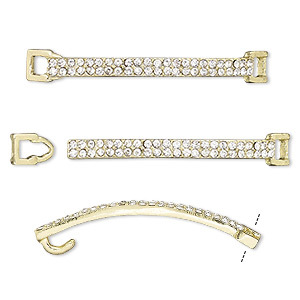 Clasp, hook-and-eye, glass rhinestone and gold-finished "pewter" (zinc-based alloy), clear, 49x13mm single-sided curved rectangle, 10x3.5mm inside diameter. Sold per 2-piece set. Clasp, JBB Findings, 3-strand hook-and-eye, sterling silver and Roman glass, 23.5x18mm. Sold individually. 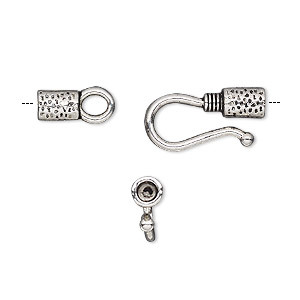 Clasp, hook-and-eye, antique silver-finished "pewter" (zinc-based alloy), 27x9mm with glue-in ends and hammered tube with rope design, 2.5mm inside diameter. Sold per pkg of 10.